This expansion module provides various additional search functions relative to the default browser. Instead of just title, artist, and audio ID, various additional columns can be displayed (such as the various criteria groups, last played, last scheduled, year, duration, artist hour number, etc.). Very useful is the possibility of ordering these columns and finding the desired information quickly. In the comprehensive matrix, multiple criteria can be selected at once. 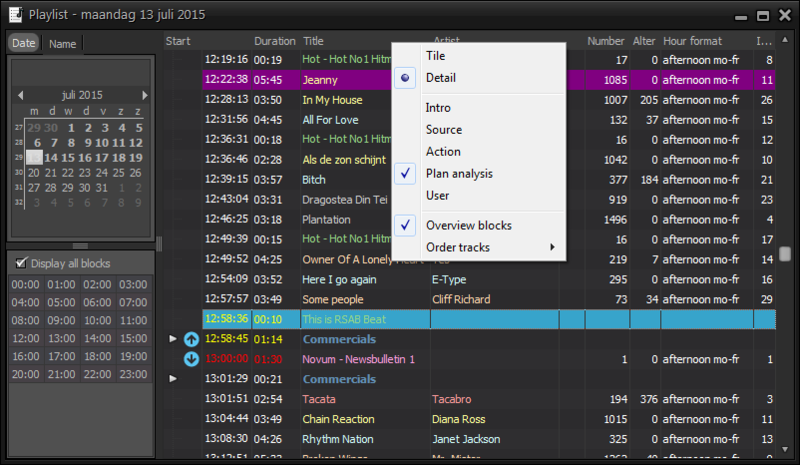 Within the module, it is possible to make a selection whereby all tracks, or only the tracks available to the planner or presenter/DJ, are displayed. The personal rights assigned play a role here. For maintenance of the Database, quickly selecting tracks that are in the database but are not physically present is a useful addition. There is also an additional tab equipped with special search functions. Here, you can select parts of lyrics, moods, texture, and various other specific criteria. Finally, Database Browser Xtra offers definable screen pre-sets per user and control features based on the history of the artist in the Database editor. The item browser is linked to the database and offers the possibility of creating your entirely own folder structure. The folders are divided into general directories, folders per logged in presenter/DJ, or folders of a particular user group. This way, Presenters/DJs which use a lot of their own design have the possibility of placing their items in their own folders with their own clear structure. 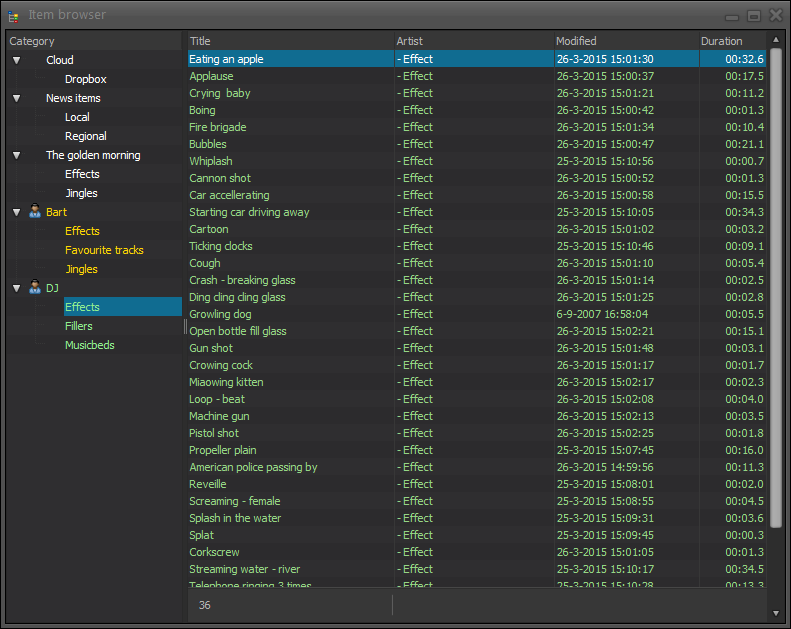 The Item Browser is also an ideal tool for radio stations which work with editors who, for example, produce news items. News items are placed in the “news folder” by the editors. The presenter/DJ in the live studio then sees the new items appear in the “news folder” directly and can apply them in his programme immediately. This module offers an expansion to the live assist players of AerOn Studio and adds, among other things, 3 quick keys to quickly navigate to cue points defined in the database. By clicking the image of the track, you directly switch to the Database Editor, and more information about the track and artist is available. With the time display, this module allows for selecting several alternative displays. This module gives radio stations the option of extending the standard Jingle player to a maximum of 8 Jingle-cart players. This way, in total, up to 56 jingles will be ready to play immediately. The ability to group multiple jingles or “loop” them is ideal for creating a “musicbed”. 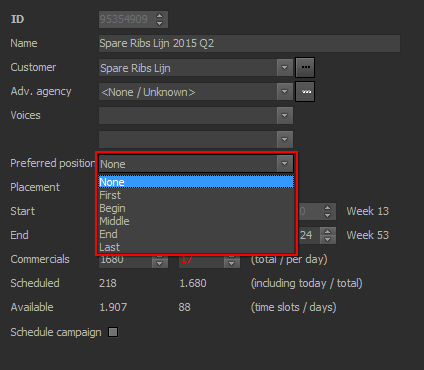 With this option, starting a jingle from one of the 3 cue points from the database is also possible. 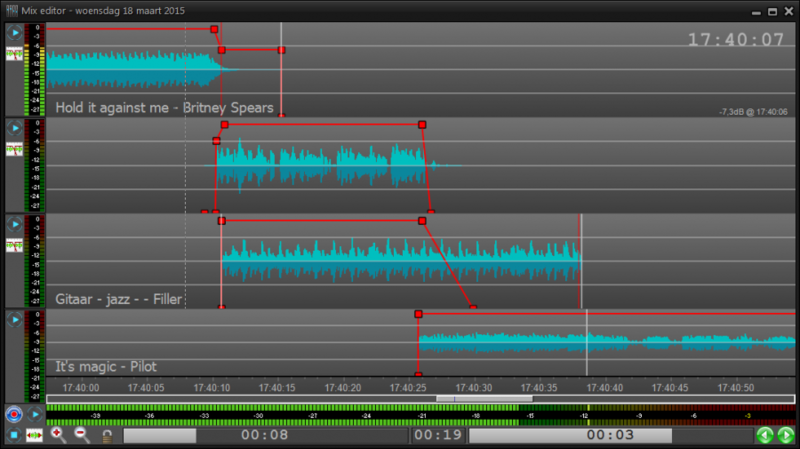 A very special feature is the ability to fill out an hour transition with a jingle either automatically or manually. This way, a jingle consisting of a bed with a closing station call always fits exactly. Recording a voice track just as in a live situation? This is possible with the Voice Tracking Extra module. The intro and outro of the track can be heard while recording the voice track and while recording, the presenter/DJ decides when the next track starts. The additional track in this module provides the ability to drag and drop designs or jingles below the voice track. Using external controllers, such as the faders of a digital Axum mixer, the outros and intro scan even be pushed with a fader. The exact fader curves are recorded together with the voice track in AerOn Studio. This way, voice tracks are indistinguishable from live audio! This basic module is required once for working with external voice trackers. External voice trackers can use their own license to log into the system and use the voice track features of AerOn Studio at home. 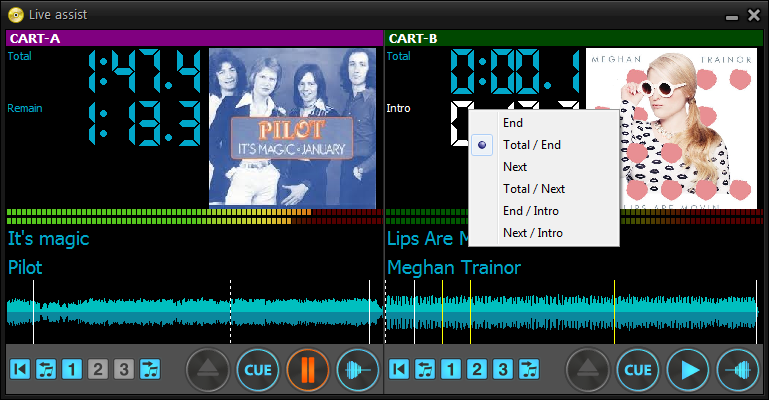 With the Plan Checker, an analysis of the Playlist is easily made. 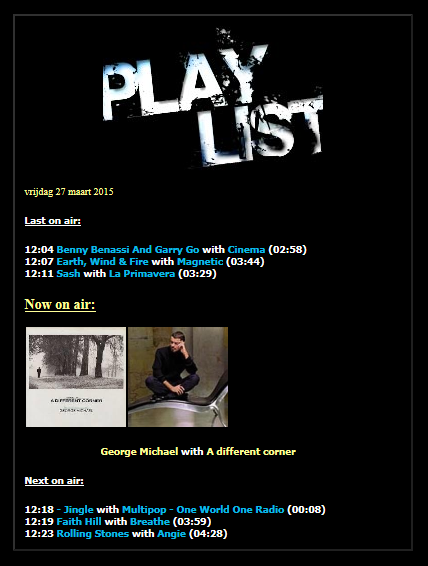 From every track from the Playlist, the hour format and plan rule with which the track is planned can be viewed. This way, you can quickly check whether a deviating track belongs in the hour format or whether the criteria of that track may need to be fine-tuned. When the Formatplanner runs into incidental impossibilities during planning, these are displayed in a comprehensive manner at the end of planning. Again, the Plan checker is an excellent tool here because with each report, the plan rule in the hour format can be checked and corrected. 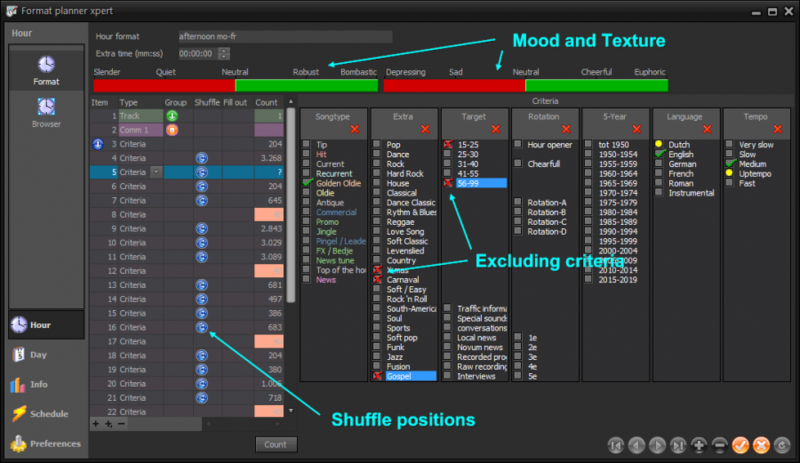 From each track in the Playlist, Database Browser, or Item Browser, the Formatplanner analysis can be initiated. This analysis shows which times and which days a track is planned for in a comprehensive matrix. Therefore, the module is a useful tool for optimising hour formats and the database. With this module, the Formatplanner is able to plan semi-fixed items. Semi-fixed planning makes it possible to place a news items within an (adjustable) time window around the hour transition. The purpose of this is to fully play the music track prior to the news without a premature fade-out. Of course, this module can also be used to manually add semi-fixed items to the Playlist. With Formatplanner Xtra, it is possible to plan for items that have been entered in criteria column 4 and 5 of the Database Editor. 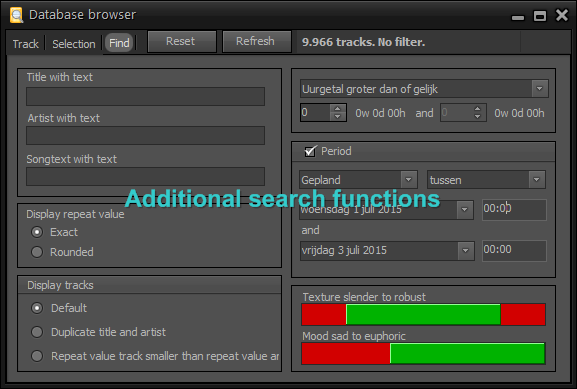 For each column, multiple criteria can now be selected, which allows for an even better definition of the tracks. 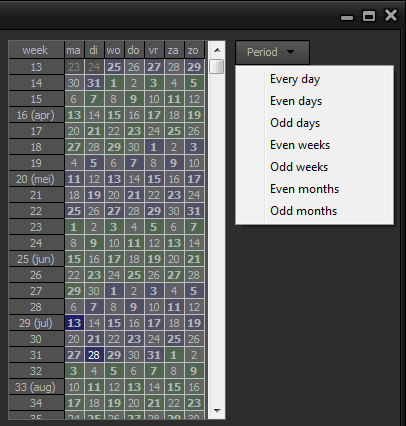 Besides the day-parts this planner also takes the week-parts into account as entered in the Database Editor. Adjustable planning rules make it possible to take a weighted decision on what planning rules may possibly be broken if during planning, it should appear that too few tracks are present in the system to meet all of the specified criteria. This module is only available in combination with the Formatplanner Semi Fixed option. 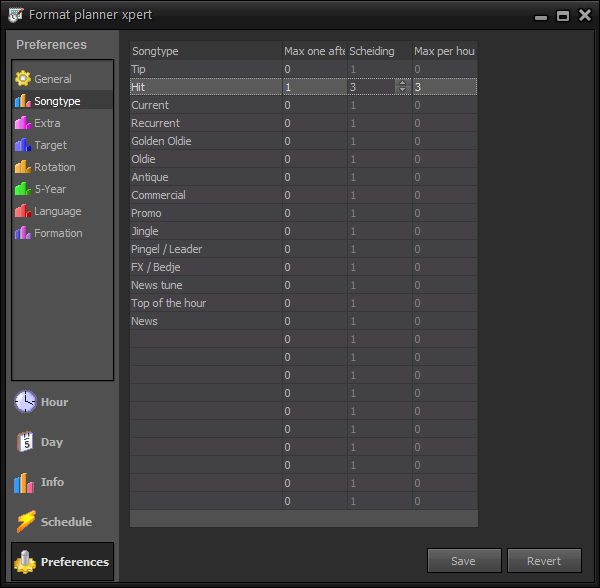 The most extensive planning possibilities within AerOn Studio can be found in the Formatplanner Xpert option. 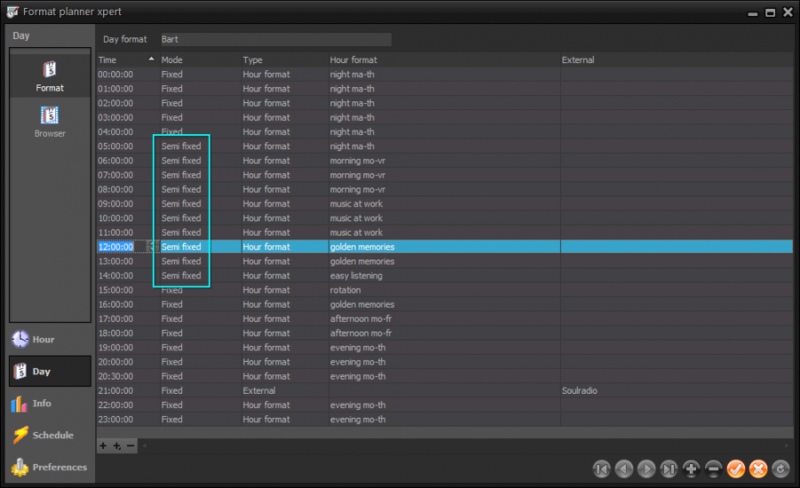 Formatplanner Xpert can prevent certain tracks from occurring in the Playlist by excluding criteria. This way, the planning becomes even more accurate. It is also possible to mark tracks in the hour format which can mutually exchange places. AerOn Studio takes this into account when planning, so that the position of these tracks is adjusted at random within the hour. By working with mood and texture, the mood of the hour can be adjusted to fit current developments with a single operation. In addition to the hour formats, it is now also possible, based on criteria, to indicate the maximum amount of tracks to be planned per hour per criterion and to determine minimum separation levels. If the playlists are planned, a number of alternative tracks are available for each track in accordance with the criteria with which the track is planned. The info screen provides a clear overview of how the amount of tracks of all criteria relate to one another within each criteria group. This way, you can quickly see whether certain musical styles, target groups, or tracks from certain years are sufficiently represented in the database. A prerequisite for this module is that it only works in combination with the Formatplanner Semi Fixed and Xtra. With the additional functionality in Commercialplanner Xtra by AerOn Studio, the preferred positions within a commercial block can be indicated. Additional placement options have been added, such as planning a fixed number of spots per day and the option of filling up empty blocks. For long-term planning, it is possible to plan based on even or odd days, weeks, or months. The design has been expanded with two additional before and after jingles, which are always played, even if there are no commercials present within the block. 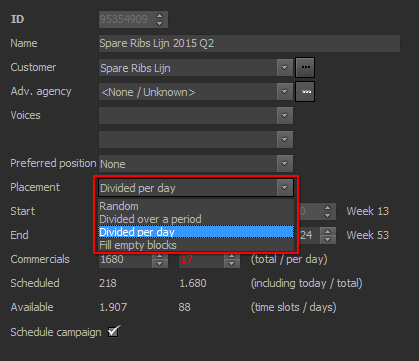 This planner also takes week-parts into account as entered in the Database Editor at each commercial. In case of campaigns with multiple commercials certain commercials can be linked to a specific day this way. Edition systems require Commercialplanner Xtra as a basis for planning for all editions from a single point. The blocks in all editions are then adjusted in length to the longest block, so that perfect decoupling is possible. Radio stations are required to record their output signal for copyrights organisations, but also as evidence that commercials have actually been broadcast. 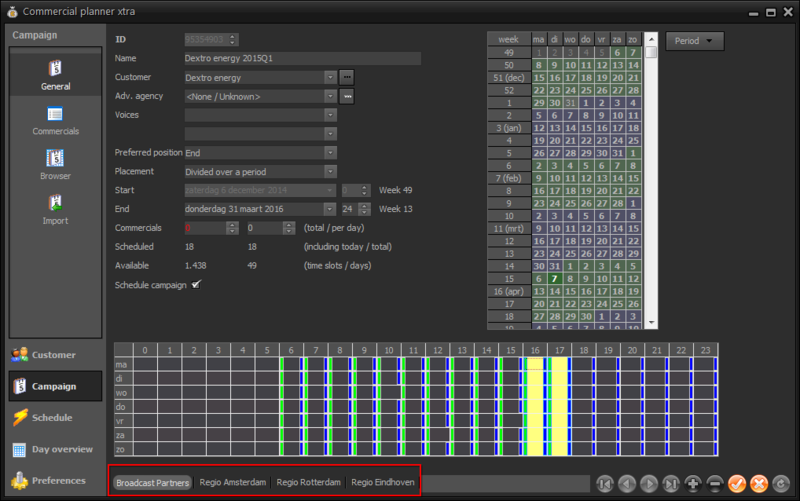 The audio logger records audio in the background using a (usually) low bit rate. In the week-hours matrix, you can indicate which hours should and should not be recorded. Of course, storage period, audio quality, and source are also adjustable. 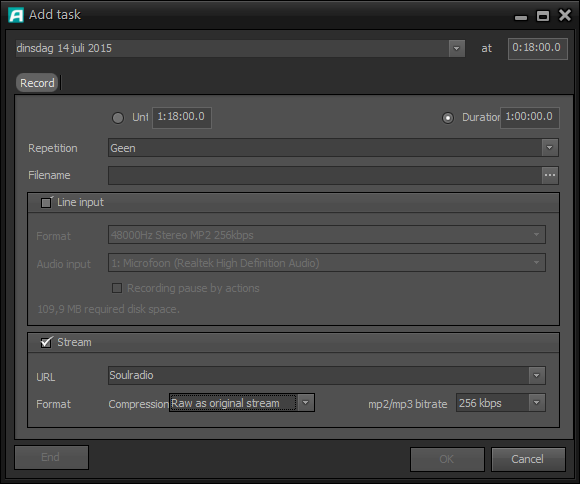 Choose the folder in which the audio is recorded, and AerOn Studio does the rest. 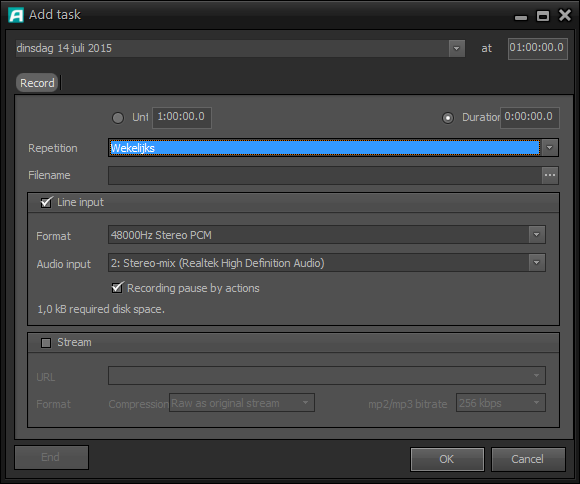 The Time Shifter is a module that allows an external source or stream to be recorded in high quality and to rebroadcast it later. This module is mostly used to record live programmes and rerun them later. Smart features make it possible to only start recording once the news with the subsequent commercials are over. It is also possible to skip intermediate commercial blocks during the recording, so that these can be replaced in the rerun. The Time Shifter is also the ideal tool for bridging time zones. For example, do you want to rerun a programme in New York that was broadcast in London at 8 a.m.? The Time Shifter automatically records the programme on a satellite connection throughout the day. The Inbox/Outbox is an external programme which allows for moving files in a convenient way. Once, for example, news files are downloaded, they are moved to the right folder in AerOn Studio, so that they can be pre-listened in the playlist from that moment. The Inbox/Outbox is also useful for radio stations with an extensive editorial staff. 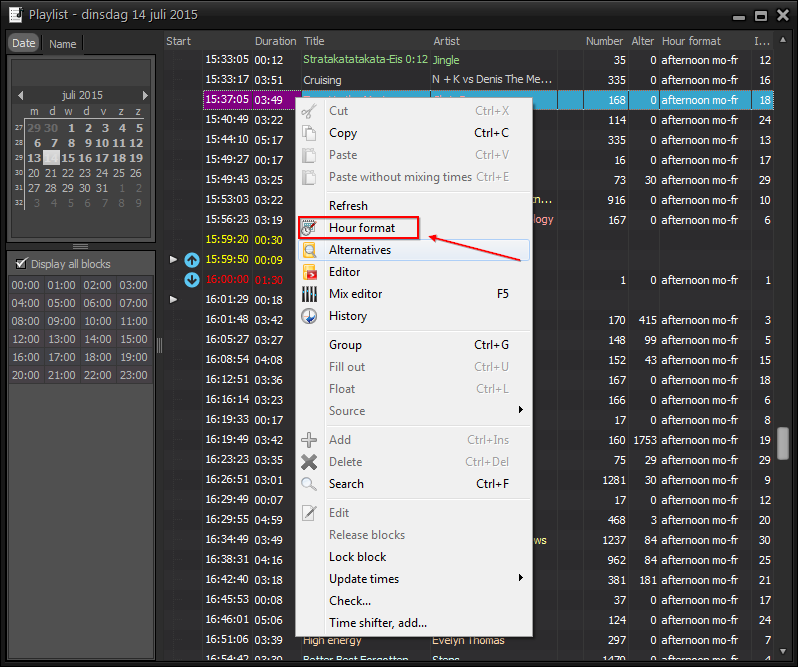 News items which are ready for broadcasting can be automatically moves from the central folder of the editors to a specified folder in AerOn Studio, after which they are directly visible in the Item Browser, marked as a new item. In the live studio, they can then be dragged from the Item browser to the playlist and played directly. 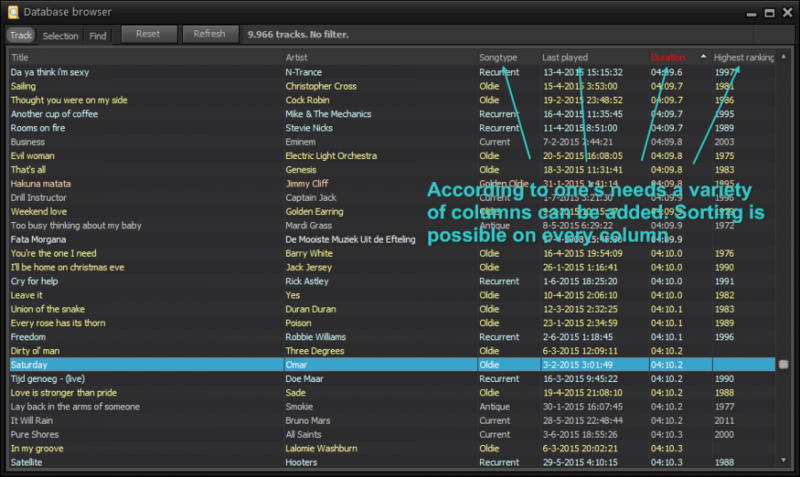 In the Database Editor, it is possible to indicate for each track whether only the title or artist, title-artist, or a custom text is displayed. In order to make it easier for the user, Broadcast Partners has developed a number of standard templates. One of the templates is specially designed for mobile applications such as an iPhone. Of course, these can be fully customized to one’s own preference. In combination with the appropriate hardware (RME sound card), this module can turn your PC into a studio switch, which routes the signal to the transmission line in non-stop mode, completely independent of the mixer. Within AerOn Studio, switching from non-stop to live assist can be controlled by a single computer. Larger radio stations generally link this separately and place the non-stop PC in the server room, which then also serves as an audio matrix. For each live studio, a separate play-out machine is installed which is connected to the non-stop computer via the network. This separate play-out machine can take over the playlist of the non-stop computer after each track transition. If using multiple live studios, every studio can take over a different studio when it is released. The presenters/DJs work on the PC of the relevant live studio during the live broadcasts. If using this method, the PC of each live studio should be equipped with the Slave studio function module. With the included Studio switch function combined with the suitable hardware (RME sound card) this module switches the connected studio or studios within the non-stop server PC. With this licence, extensive production work can be performed on a PC or laptop. The standard functions of AerOn Studio are then available on this production station, with the exception of the non-stop function and the Live assist cart players. If additional modules have been purchased for the main system, these will also be active on the production station. Additional editions with AerOn Studio are composed from several AerOn Studio versions. In addition, the Edition module is required for each edition. Among other things, the mutual interaction between the editions, with which actions of the main system on the edition PC will play regional jingles in sync, can be controlled with the Edition module. In combination with the Commercialplanner Xtra in the main system, commercials can be centrally planned for all editions to allow perfect synchrony. The Edition functions allows for automatically switching the RDS signal during decoupled commercial blocks, so that car radios cannot switch to a different frequency during a commercial block. 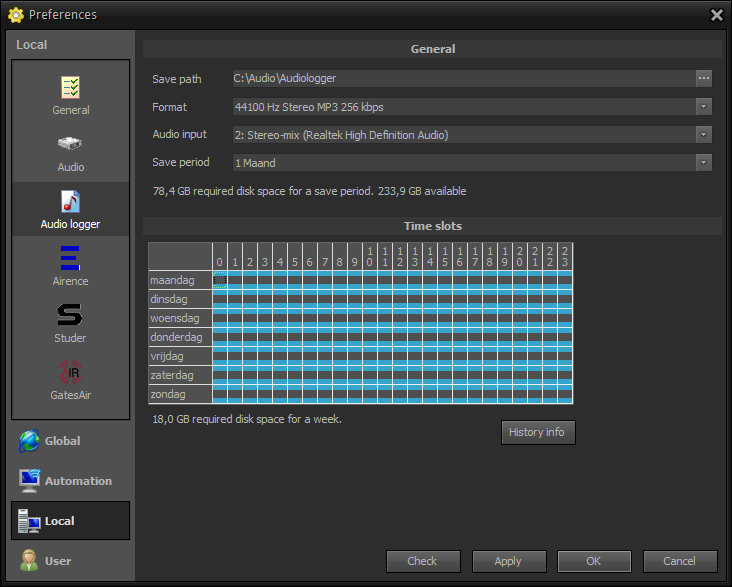 Of course, this is in combination with a suitable RDS encoder and RDS software. On the main system, a separate commercial playback channel can be created for the decoupling of commercial blocks. With edition systems, it can be economically interesting to run multiple versions of AerOn Studio in parallel on one computer. This not only saves rack space, but it also simplifies management. Multiple Playout makes that possible. The number of versions that can operate in parallel on one machine depends on the PC type and the quality of available outputs on the sound card. Virtually all digital mixers are controlled by a standardised or custom protocol. A number of manufacturers now see the big advantage of the integration of radio automation with their digital mixer and have made these protocols available. Broadcast Partners has been able to integrate a number of protocols into AerOn Studio, including the Mamba protocol (Axum) and the Ember protocol (Studer). Also some manufacturers of analog mixing consoles (Airence, Airlite) use digital protocols so that fader- or button starts or other controllers can be integrated with AerOn Studio over USB. With this module, the integration is activated.